In v5 you could use the ip number website link to update the data in the iPhone app to match the backup file on the Windows PC. I can't find that option in v6. Is that still possible or do I have to setup a sync to a cloud provider? Or is there another way? 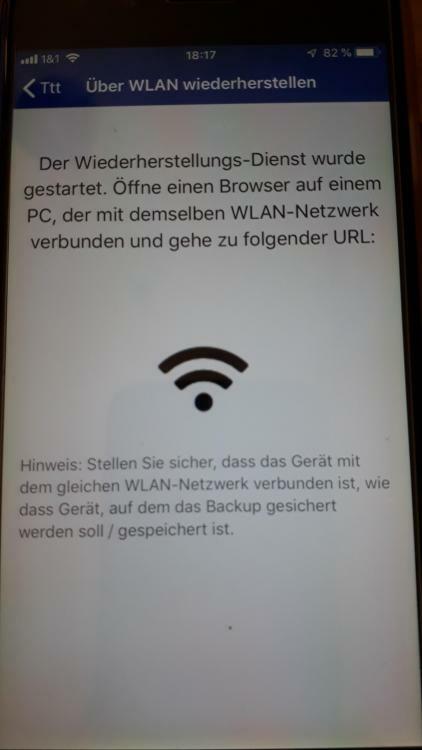 since version 6 there is no longer the possibility to install a backup created on macOS via WLAN on an iOS device. In version 5 this possibility was available. Since I don't want to use cloud services for my passwords, this was the easiest way to synchronize the passwords with the mobile devices. Please fix it. This feature is only available when you add a new vault or start fresh after erasing all data. It was left intentionally because of many conflicting situations in multiple vault scenario. A brand new Wifi-Sync feature is in development. It will avoid need of manually restore your vault each time from desktop. Till than you can achieve the same result by this method. Create a Primary vault with your master password. Restore a secondary vault from wifi restore. Set it as default vault for saving new items. Next time you need to restore it, delete secondary vault and repeat step 2,3. I know this will left out few things that are essentially stored in primary vault only, other than that everything should work fine. I don't see a URL at point 2. The WLAN restore field after the colon is empty. I don’t have to do this anymore. Here are my steps for getting my Enpass data to the app on my iPhone. Then I just type the link from the iPhone screen into a browser on my Windows computer and follow the directions from there. If someone knows of a better way please post it here. Thanks!